I finally depotted all my MAC eyeshadows that were still housed in pots a few weeks ago. It took some time, but I'm just happy I finally have them in my pro-palette, and I can finally take the empty pots to Back2MAC and get my freebies. Anyway, I also had some Milani eyeshadow that were in need of depotting (Milani e/s are the same size as you MAC e/s in a pan). I didn't really have any idea on how to this, so it was a trial and error on the Milani eyshadows I owned. After a few attempts and one busted eyeshadow, here is probably the best way to depot your Milani eyeshadow, without cracking it, in ten steps. Remember you must be very careful with the whole procedure to avoid any casualties. Step 1: Find an area to depot your eyeshadow. Make sure you place a clean paper towel on your work area. Step 2: Peel the label off at the bottom of the pan. You will then see a small hole hiding under it. 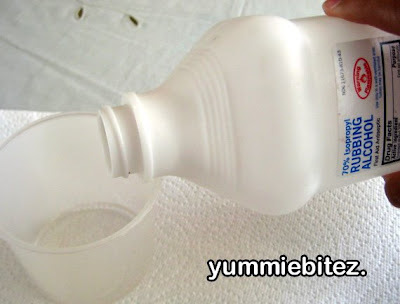 Step 3: In a clean container, pour a small amount of rubbing alcohol. 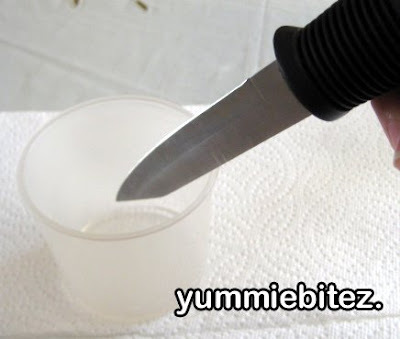 Step 4: Take your paring knife (or a dropper) to take some rubbing alcohol. Step 5: With the help of your paring knife (or dropper), carefully put some rubbing alcohol in the hole at the bottom of the pot of your eyeshadow. This will help loosen up the glue inside. Get about 3-5 drops inside, then let it sit for a few minutes. 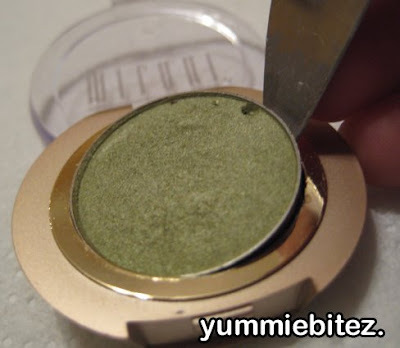 Step 6: Flip your eyeshadow top side up and find a space in between the pan and the pot. CARFULLY insert your paring knife in between the space while CAREFULLY wiggling the pan off the pot. You can try and go around the pan, and make a bigger space. This will help the alcohol kinda move around inside and pop the e/s pan out. Step 7: Pop the pan off the container. Maintain a steady hand since you're inserting a paring knife in a small space (which is why my e/s in this picture is nicked). Do not apply too much pressure when popping the pan off. You will break your e/s. If the pan won't readily come out, put some more rubbing alcohol in the hole, and let it sit a little bit longer. Patience is key! Step 8: Once you've popped the pan out, clean the bottom of the pan with rubbing alcohol and a tissue or cotton ball to remove the glue. 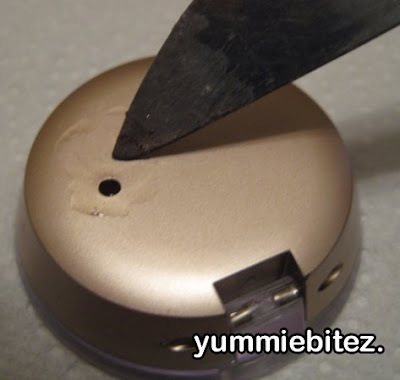 Step 9: Place a round adhesive magnet at the back of your pan. 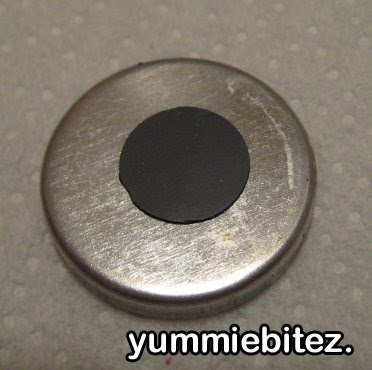 You can put a sticker label on top of your magnet if you wish. Step 10: And TA-DA! You're Milani Eyeshadow is ready to be housed in your MAC pro-palette. I hope this helped some (at least one) of you. Now you can depot all your Milani eyeshadows and put them in your MAC palette. Remember patience is the main thing you need when doing this. So don't take your anger out on your poor eyeshadow. If it won't budge, try to put more rubbing alcohol. 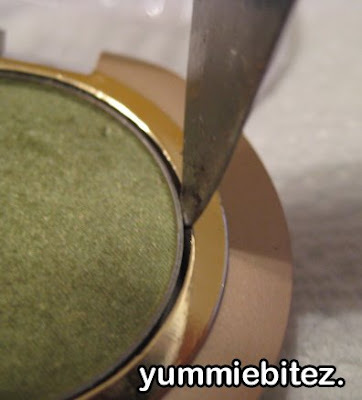 Happy depotting! I didnt know milani eyeshadows fit MAC palette :O thanks for the tut/tip! interesting. i never thought to use alcohol to depot the milani e/s. i used my flat iron and that worked pretty well. Pretty coollllll. :) Thanks for the tip. I was wondering if you can get those big MAC palettes by any MAC store or do you have to go to a MAC Pro store??? very cool that milani fits in the MAC palette! now i'm gonna hafta go buy milani eyeshadows!!! 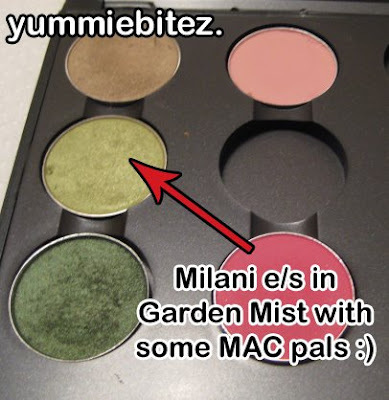 I also didn't know that Milani e/s fit into the mac palettes. I don't own any, but this is a great tutorial! I also think your graduation picture makeup is awesome! I love those natural, but subtle looks. It makes me want to get true romantic BPB. great tut hon! 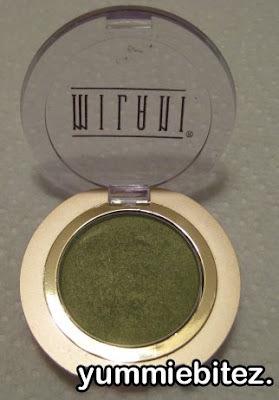 i've seen others but I think you've added tips which i haven't seen before...i got to get on this milani shadow tip! It's funny how some people didn't think they would fit in the MAC Palettes, yet they have the same circumference...lol. I poke that sucker out thanks to the hole at the bottom! 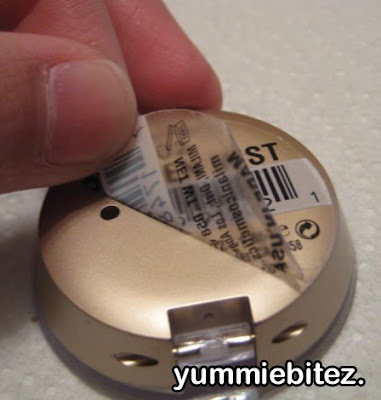 Where did you get your adhesive round magnets. I know Michaels has some but they're too thick that make my depotted e/s looked funny in the pro-palettes. Thanks for doing this tutorial. I have some Milani e/s and had been wondering how I can depot them. Thanks! 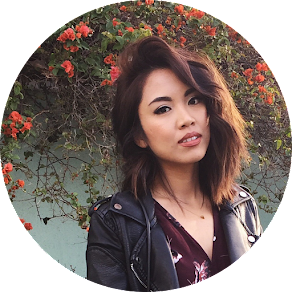 Oh by the way, I linked your blog. 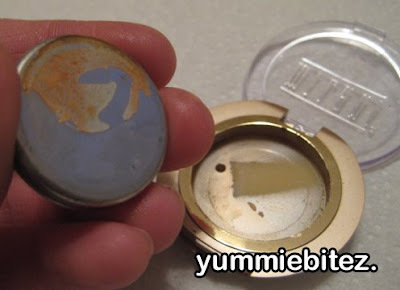 If you take a push-pin/wall tac and push gently thru the hole with the shadow laying down on a paper towel or wash cloth the shadow pops out much more easily. I've done it that way with all 10 of my Milani shadows and have yet to break or chip a single one.